A complete showcase on India and a in-depth focus into its culture, diversity, heritage, history and every detail to the minutest that a traveller to India would want to know. Get to know the mysterious Indian even before you get there! 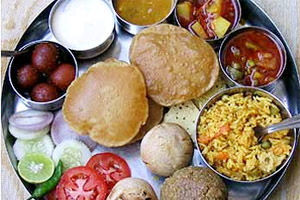 The Rajasthani kitchen is able to create less from little, yes but the food here is diverse as per the traditions of the people. The Rajput warriors did hunt for animals and eat non veg food while the Vaishnavas who were the followers of Lord Krishna were strict vegetarians. The Marwaris or traders are vegetarians too and the Bishnois were the conservers of nature. The Jains here would not eat after the sunset and avoided garlic and onions in their food. Lets have a look into a few dishes exclusive of this place. Hunting was a major sport of of the Rajput men. Often men did the cooking themselves. When small animals were hunted down uch as the hare, the animal was cleaned, stuffed and allowed to cook in a pit made in the sand with a bed of live coals covering it. It often cooked overnight. But when large animals were hunted down like the deers the meat was marinated and then it was barbecued over live coals. This is called sulla here and is a delicacy. Karhi called here as the khatta is a part of their maple diet. It is made from buttermilk and a mix of flour and some spices. It stays in fire for a long time. Papads are gravied to form a curry. Gatte ka sag are chick pea flour made into dumplings and cooked. It is eaten with bajra rotis or porridges. Deserts were rare except for some festive occasions. Seera is such a delicacy which is made of wheat flour sugar and ghee. Rice a delicacy in Rajasthan was served as a sweet along with sugar, saffron, dried nuts and raisins. The Marwaris had a meal of pista long served with milk topped with cream. Puris fried in oil. Tomato curry which is sweet, sour and hot with gatte ki sabji and sangri ker ka saag and dahi ballas. This is followed by suji ka halwa which is a pudding and to the end a glass of lassi. Halwas, barfis and ladoos are a part of the Marwari preparation with til, seseme. Milk, buttermilk and yoghurt formed a major diet of the people here could be due to the lack of vegetables. Other to the popular Indian deserts is the principal offering during the Muslim Urs and EID fetivals at Ajmer when cauldrons of it are prepared at the dargah of Khwaja Moinuddin Chisthi. The cauldrons is nearly 3 m in diameter and in it rice, milk, sugar, butter, nuts, spices and dry fruits are cooked. Once done the attendants jump into the scalding centre and serve it to the people there as a holy offering. Most days here rice ,meat and lentils are served together.